"Doing good" builds communities and personal leadership. Perhaps Generation Y set out to change the average corporate structure because many of them watched their parents punch in a timecard and pay their dues at a job that was stable, but not necessarily fulfilling. Perhaps those millennials visited their parents’ dreary cubicles and sensed the tension in the air. Maybe they saw their mom or dad stress about their kids getting sick, which would force them to ask for time off – because heaven forbid they suggest working from home. In general, those belonging to Generation Y do not see themselves as ‘indentured employees.’ They view their relationship with their employer as a partnership, where both sides should benefit, instead of their employer receiving the majority of value produced from their hard work. This has forced companies to re-examine how they treat their employees in order to retain a productive workforce that helps their organization continually grow. Millennials have also demanded that corporations instill a sense of humanity, which has manifested itself in flexible work hours for a better work / life balance, collaborative workspaces to inspire innovation, and maybe the most impactful, corporate responsibility to efficiently make the world a better place just by going to work every day. According to a recent survey, 75 percent of millennials would take a paycut to work for a socially responsible company. This forward-thinking generation wants their work to be backed by a purpose, which explains why 64 percent of millennials won’t take a job if a potential employer doesn’t have strong corporate responsibility practices.Their desire to make an impact on the world is what motivates them to be dedicated employees, leading to better organizational performance as a whole. Google allows employees to use 20 percent of their time to work on side projects, which has manifested in some pretty amazing “giving back” initiatives. One such project is the “Mind the Gap” program, which was founded by two female engineers who set out to foster more women in STEM roles. These seasoned tech pros welcomed junior high and high school-aged girls to visit Google and took the time to pass on their wisdom. Projects like these not only change the lives of the young people they were designed for, but allow employees to exercise their knowledge and work on their communication skills. Through my corporate experiences, I have found that when we experience personal leadership through community involvement we apply our learnings not only in our personal lives, but our professional lives. We gain a sense of pride and confidence by helping others that we model back in our work environments. YapStone chose to focus its community project on homelessness, because we process the payments for apartments and vacation homes and it seemed like a natural fit. 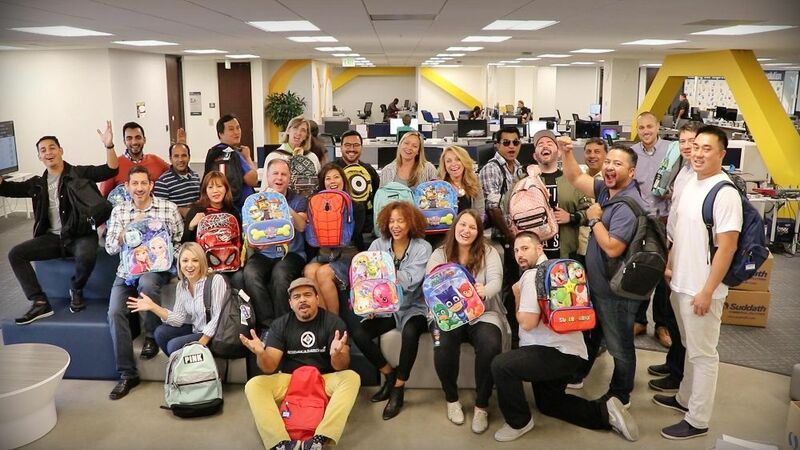 In any given month, our team puts together care packages for homeless children, fills backpacks with baby essentials for first-time homeless mothers, writes letters to homeless teen moms, works together at local shelters, and even goes into the poorest areas of Oakland to distribute food. We’ve seen tremendous leaders emerge from these activities. Two of our “YapSters” that enter into the poorest neighborhoods of Oakland to distribute food to the homeless are demonstrating skill development. You can see their most recent visit here. This simple act of kindness displays some of the greatest qualities of leaders: courage, accountability, dedication, integrity and generosity. Through their community involvement, this dynamic pair are developing skills that are essential to their job while working outside the boundaries of their day job. Debra Tenenbaum is responsible for leading the human resources and internal communications functions at YapStone, focusing on the enablement and engagement of YapStone employees. With over 20 years of business leadership, human resources and executive coaching experience, Debra has led a number of high-growth technology companies, including SGI, Netscape, and Loudcloud/Opsware, through corporate acquisitions and IPO’s. Most recently, Debra was the Chief Learning Officer at Epicor Software where she focused on cultivating management and employee development. Debra received a Masters degree in HROD from the University of San Francisco and a BA degree from the University of California at Santa Barbara.